U15 Boys were crowned North of England XC Champions at Harewood last week as the ladies continued to impress all round, with two team bronze medals. The harriers again had a strong entry for this second of the 2018 championships - following their good performances 3 weeks earlier at the county championships. The bulk of the athletes who had competed in the Yorkshire event were again competing, but were augmented by some who had competed in the Derbyshire championships, and their contribution was to have a marked effect on the U15 boys team results. The venue had never before been used for these championships, and the rolling landscape of the South Park - created by Lancelot "Capability" Brown - was always going to create a challenging and varied course for all the races. One advantage of all the available space, is that a lap of 6Km long is possible for the senior men, which means that the 12Km race distance can be covered in 2 laps - which reduces the problem of the race leaders being slowed by the mass of runners they would ordinarily encounter over a 3 lap event. The week leading up to the event had seen Storm Georgina bring very heavy rain, and this had a double effect, parking on the grass areas needed much work to ensure that cars did not become stuck; and it also meant some areas of the course laps were very wet, with ankle deep mud. However, the clubs athletes - with many months of hill training behind them on Herringthorpe playing fields - were well prepared and produced the best club performance at this level for many years. The club athletes had 7 complete teams (races have 4 athletes to score in the team race, with 6 to score for the senior men) and of those teams 6 finished in the first 10 - an incredible performance when you look at the strength of the clubs and athletes across the North. Pride of place went to the U15 boys team, who after a nail biting wait were confirmed as the winning team, but it was very close! Both the first 2 teams (Rotherham & Hallamshire - who had been battling all winter in the South Yorkshire league races) had the same points total - 186, and the deciding factor was the finishing position of the clubs 4th finisher. Sam Gilson was our 4th scorer in 100th position, whereas the Hallamshire 4th placed athlete was 113th. The winning quartet - Eliot Morton, Will Beaton, Joshua Wragg and Sam Gilson, richly deserved the win. The trophy shows that exactly 40 years earlier, in 1978, Rotherham had won the same cup - helped no doubt by the presence of future Commonwealth, Olympic and world title holder Peter Elliot in that team. There were two further team medals won by Harrier's teams - The U17 womens team of Mya Taylor, Cyane Robinson, Emma Ball and Keiva Rennocks won a well deserved team bronze, behind winners Vale Royal AC and Liverpool Harriers. Mya's 4th place and Cyane's 6th place were the best individual placings on the day. The senior women's team who have previously won gold in 2015, bronze in 2016, and silver in 2017 won their 4th team medal in a row, finishing 3rd - with 170 points - behind very strong teams from Sale (132 points) and Leeds city (158 points). 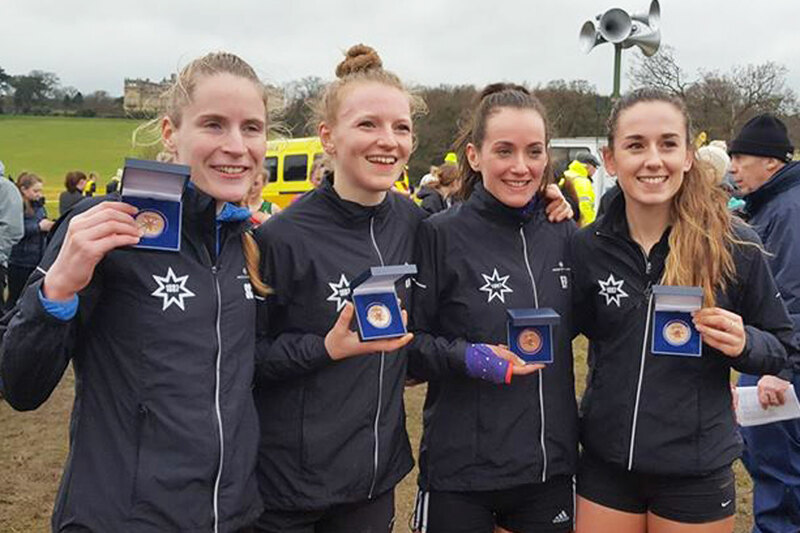 The team of Sophie Cowper, Natasha Hatswell, Emma Parkinson & Zara Knappy were also strongly supported by Steph Burns, whose 43rd finishing position would have guaranteed the bronze team medals had any of the first 4 faltered. Further club athletes managed top 10 finishing positions as follows: Joe Massingham 7th in the U 20 men's race, and Elliot Morton 10th in the U15 boys race. The senior mens team wnet one better than last year with an impressive 8th team place - achieved by some great packing of individuals - with all the scoring 6 inside the first 100 finishers, led home by Elliot Smales in a very impressive 29th spot. Sale harries won the team race from leeds City in 2nd some 26 points behind. The club goes from strength to strength - there were many great indiviudal performances here, and we look forward now to the National Championships on the 23rd February at Parliament Hill, London. 1st 10:44 Joshua Blevins North Shields Polytechnic. 28th 11:43 Joshua Gilbert, 58th 12:05 Luke Parker, 59th 12:05 George Browne, 80th 12:19 Thomas Bowman, 89th 12:25 Alex Brand, 125th Reece Levitt 12:50, 220th 14:56 Harry Stroughair. 36th 12:35 Olivia Bell, 50th 12:43 Amelia Topliss, 98th 13:18 Marci Walsh, 102nd 13:21 Miya Lambert,131st 13:43 Evie Thomson, 192nd 14:48 Cadence Taylor. 10th 14:36 Elliot Morton, 32nd 15:02 Will Beaton, 42nd 15:19 Joshua Wragg, 100th 16:07 Sam Gilson, 148th 17:12 Jack Steele, 152nd 17:15 Jay Jessop. 139th 20:06 Abby Stroughair, 144th 20:13 Lahana Vardy, 146th 20:17 Ciara Mullane, 167 21:24 Elina Hine. 65th 23:17 Jack Stokes, 85th 24:23 Oliver Jervis. 4th 21:13 Mya Taylor, 6th Cyane Robinson, 30th 23:56 Emma Ball, 57th 25:24 Keiva Rennocks, 62nd 25:56 Bethany Mount, 75th 27:01 Emily Holden. 29th 41:52 Elliot Samles, 61st 43:43 Dan Kestrel, 69th 44:06 Aidan Johnson, 74th 44:14 Jonny Johnson, 79th 44:27 Aaron Larkin, 89th 44:59 Richard Harris, 168th 47:34 Gareth Sampson, 183rd 47:51 Kyle Craib, 216th 48:55 Philip Hoole, 495th 56:11 John Comrie, 511th Howard Darwin 56:58. 10th 32:31 Sophie Cowper, 12th 32:40 Natasha Hatswell, 29th 33:32 Emma Parkinson, 30th 33:35 Zara Knappy, 43rd 34:23 Steph Burns.